Here is the book that started it all. 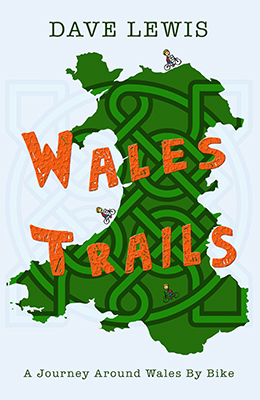 Wales Trails should help get you in the mood, inspire you to dust off that old Raleigh rusting in the shed or at the very least inform you about all the great stuff in our small but beautiful country. 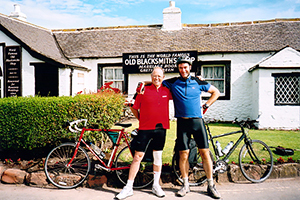 In 2016 Dave turned fifty years old and realised that eleven years was far too long to wait between cycling adventures, even though in 2005, after he and a friend rode the iconic Land’s End to John o’ Groats challenge, Dave swore he’d never sit on a saddle again. “When you’ve forgotten the pain of your last time on a road bike why not invent a new and exciting challenge closer to home? 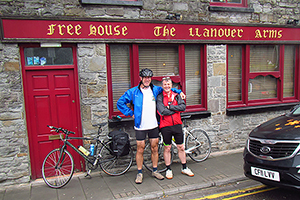 The plan – to create a loop of Wales, ride over 600 miles for charity and put your country firmly on the cycling bucket list. More than just a guide, this book is a funny and thought-provoking account of two weeks in the summer of 2016 when one man’s dream becomes reality. If this book doesn’t encourage you to get on your bike, while you still can, it should at least provide a few laughs as you sit in the pub reading it. The last time I decided to cycle anywhere further than the corner shop for a pint of milk and a Tiger loaf was back in 2005 when my friend Derek agreed to go along with my idiotic suggestion that we ride almost 1,000 miles, uphill, from Land’s End in Cornwall to John o’ Groats in Caithness. The good news about that trip was that somehow, through much adversity, we did eventually make it. We had a fantastic time, met some wonderful people and got so drunk in John o’ Groats that I bet the locals are still wondering what hit them. It was Mark and his awful jokes by the way. The bad news was that my bottom would never be the same again. Neither would my faith in British engineering, as my brand new Dawes Discovery 701 seemed to have this strange dislike of spokes. Keeping them attached to the wheel that is. So, with the wrong wheels, racers, not tourers, our intricately planned (on the back of a beer mat) historical and wildlife sightseeing trip through England and Scotland quickly turned into a bike shop Trip Advisor adventure! When Steve Redgrave said to shoot him if he ever went near a boat again I uttered a similar refrain after pole dancing around the famous John o’ Groats signpost back in July 2005. But, after a couple of gallons of Scottish beer I completely forgot about this sacred vow, my tender posterior, seized-up knees, sunburnt hands and aching back. And like the amnesiac fool that I am I haven’t stopped talking about doing a similar ride for the last eleven years. Luckily, no one would listen to me long enough for it to become reality. A lot can happen in ten or eleven years though. Sadly, my wonderful dad passed away, my mam moved house, and my daughter gave up her bottle, whizzed through primary school, became fluent in Welsh and then metamorphosed into a six-foot teenager. I started a fabulous new job, teaching computers, digital photography and Photoshop to adult learners about fifteen minutes drive away from the house. Then, about eight years later, I lost it. The job I mean, not my marbles. They went years ago. Now, as it happens I’ve always been pretty good at losing jobs. In fact, since 1989 I reckon I must have had over twenty-five or even thirty different jobs, often doing two or three at the same time. Sometimes I just give them up because I get bored or I fancy doing something else other times there are more sinister forces at work. I once gave up a Head of Biology teaching job in a great school with great kids to go to Kenya to look for elephants. A year later, I’d seen the elephants and was back in Wales. Then about a week afterwards I decided to try to learn German and go to the Seychelles to tag turtles. I didn’t go in the end. Never been any good at languages. Eleven years previous, 2005, the ride and adventure that inspired the ‘Wales‘ idea. 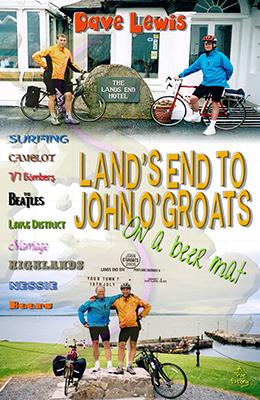 The End to End iconic cycle ride that was planned on a beer mat and became a best-selling kindle e-book. More than just another cycling trip, this e-book is a funny and sometimes moving account of a few weeks in the summer of 2005 when coupled with various personal events life takes on a new and different perspective. Finally published, 10 years later, this gem of a little book will either inspire you to get on your bike or have you laughing all the way to the pub. It was in a curryhouse in Taffs Well, sometime in May 2005, when my girlfriend announced to me, in the presence of two of our best friends, that we should get married. I nearly choked on my Chicken Tikka Dupiaza! I wish she’d waited until I’d finished my meal at least. I quickly sank the dregs of my Kingfisher lager, gulped some much needed oxygen into my lungs, went ashen white and mumbled an incoherent reply. Alun and Sian were laughing so much they nearly fell off their chairs! In 2002 I’d become a dad and our precious miracle baby; who’d somehow ignored the sterilisation and lack of a full compliment of fallopian tubes in my wife-to-be, needed a married mam and dad. At least that’s what my mam and dad thought, worried that our hippy existence wasn’t the best way to bring up a child in 21st Century Wales these days. There was another reason too. My dad had been diagnosed with terminal lung cancer and it was only a matter of time. So, with a heavy heart and a thousand emotions swirling around inside my mostly empty head what could I do? ‘You don’t look well Dave,’ said Alun, still smirking like Shrek. The wedding was to be a small affair. Registry office, two witnesses; Alun and Sian, two bridesmaids; our respective daughters. We told no-one. Sue planned and arranged it all. I bought an orange shirt from a trendy clothes shop I’d never be seen in again and the kids; Eve and Eleri, got excited about dressing up in their frilly little numbers. God they start early eh! Such was my state of shock in the weeks leading up to this monumentus occasion that I needed constant liquid sustenance. I also wouldn’t have survived the ordeal without continuous reassurance from our friends, funny stories from Mark, a dose of glandular fever, some double pneumonia that nearly killed me and five days in hospital, you know, the usual things. And so it was, over a few pints, then a few pints more, with my secret still in tact, during one such male bonding session that me and Derek started talking about cycling. Now I don’t know what Ranulph Fiennes does when he begins to plan an epic adventure but I’m sure he could have avoided frostbite and sawing his own fingers off if only he’d scribbled down a few ideas on a beer mat before setting sail for the land of penguins and yellow popsicles. For example, he could have written, in a leaky biro from behind the bar of the Llanover Arms, Pontypridd – ‘Don’t get frostbite’ – and that would have surely saved himself a lot of digit trouble. As for me and Derek well we should have written – ‘Don’t buy a Dawes bike’ or ‘Do some training first’ or ‘Make sure you book some B&Bs’. Actually, looking back, I think we needed a few beer mats but hindsight is a wonderful thing. So, having got married and missed the impromptu party that started in our house after someone spotted us all dressed up (‘What? Dave in a shirt?’ someone said) taking photographs over Ponty Common, me and my new wife contemplated life apart for two weeks on our brief, one-night honeymoon in an old country house somewhere between Brecon and Crickhowell, paid for by Alun and Sian. ‘Derek, you’re drunk!’ I slurred. ‘Not as drunk as you are Dave,’ came the reply about three minutes later. ‘Stop stating facts,’ said Derek. ‘Yeh, well, anyway, I have bad knees, so it wouldn’t work,’ I continued. ‘You’ll be fine Dave. I used to go fishing to the reservoir with my knees and I always got lost on the way home,’ added Derek reassuringly.